The process by which a cell duplicates its genomic DNA to pass on to its daughter cells is known as DNA replication. Before cell division can occur, the DNA helix must be separated into its constituent strands. The two strands have different directionality from the replication center– and because of this, they are duplicated via different mechanisms. The leading strand is synthesized continuously while the other so-called lagging strand, is synthesized via short DNA fragments that are subsequently joined to produce a continuous DNA strand. Despite this difference in mechanism, the two strands are copied at the same overall rate. Until now, just how this feat is accomplished by the cell was not clearly understood. Research performed at the laboratories of Professor Taekjip Ha in the Department of Physics at the University of Illinois, Urbana-Champaign and Professor Smita S. Patel in the Department of Biochemistry at Robert Wood Johnson Medical School using state-of-the-art single-molecule and ensemble methods recently solved this problem by discovering mechanisms that help coordinate DNA replication (Nature 462: 940-943, 2009). They show that formation of a loop in the lagging strand allows the enzyme that copies DNA to quickly begin synthesis of short DNA fragments (as shown in the figure). 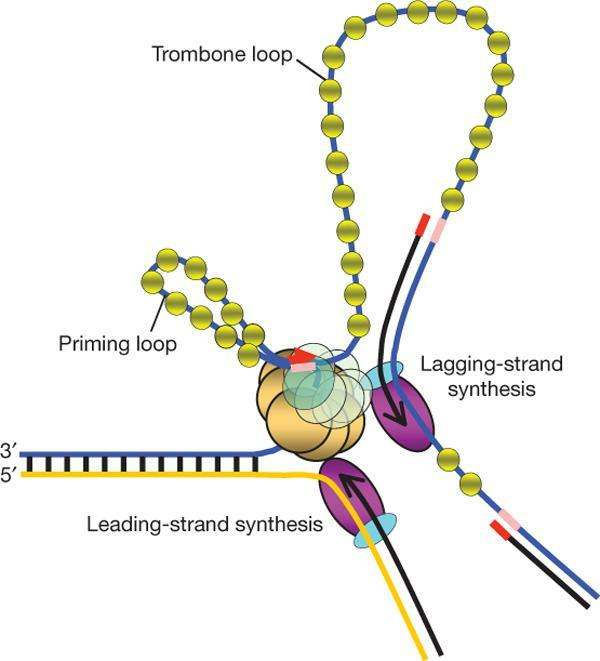 Furthermore, they reveal that faster synthesis of the lagging strand enables it to keep up with the leading strand.